Fill out this quick contact form to get in touch with Skaggs Walsh. Need something more specific? Get in touch with us on our general contact form here. Panicked when saw water shooting out of pipe .... called my oil delivery company remembering that they do plumbing .... good call. Took a bit of time to come as it was during a snow storm aftermath ... and I was on list for them in order of calls that came in. The guy who came fixed it quick and neat ..... was not out for the money or hidden agenda ... just got the job done and was professional. Shout out to Ivan, and I don't remember the guy who came to my house something junior, but he was awesome...overall great service. I just wanted to drop you a note to tell you how pleased and impressed with the service provided Thanksgiving eve by your employee who you sent to Ms. Unger. I think his name was Keith. He jumped right in and solved the problem in a very efficient, professional and friendly manner. As a result I would have no hesitation recommending your company to my clients. Please send me a dozen business cards to display on my rack of recommended vendors. The fact that you would have someone there within a few hours of my call, especially on Thanksgiving eve was greatly appreciated. As I mentioned in past correspondence, Ms. Unger died, so mail should be sent to me since I am the named executor in her will which is being probated. As soon as I am appointed and funds become available, the estate will pay whatever is due to you. It’s probably fifty years I’ve been a customer if you total up my years with Sunrise Oil (before your time). I just want to say it has been a pleasure doing business with you in every area of your services. I’m in the process of selling my home of 52 years, downsizing maybe to a senior community (please tell Lacy). 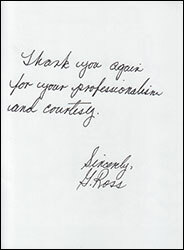 As busy as I am, I could not go without saying thank you, you even make the high cost of oil bearable. May God’s light continue to shine upon you so you may radiate it to others as you did to me. 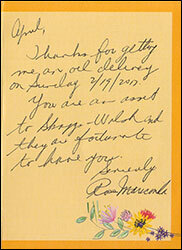 We wanted to thank your Sales Associate, Paul Wesoly, for his help in obtaining a rebate for us. Although he was not the person involved with our upgrading to a new Slant Fin oil burner last year, he persevered and researched the information that was needed to complete the application for our rebate. Although it took some time, it was worth the wait! Although we have considered switching to gas heat, in the end the dependable service we receive from Skaggs-Walsh has kept us as a customer. Thank you for your reliability and continual care and service! Happy New Year and health to all! PS - Thank you too for your commitment to our environment (and the tax letter). Keep up the great work! Just writing to say thank you. My mother and father have been a customer of yours for over 25 years and have always had nothing but the best to say about your company, service people and of course Maria! Thanks for the superior installation of my new boiler and tank. I just had a tune up done on my boiler on Friday. The technician named Junior did an outstanding job and was extremely courteous and professional, the best I have ever seen. Your company is outstanding and it was a pleasure to have met such a great professional! Thanks for getting me an oil delivery on Sunday 2/19/2017. You are an asset to Skaggs-Walsh and they are fortunate to have you. Thank you again for your professionalism and courtesy. We have been extremely satisfied with Skaggs-Walsh, especially the way you truly went above and beyond during the desperate time of hurricane Sandy. Thank you again for your dependable and courteous service. Thank you for sending Neil Junior to our house. Neil Junior was very thorough in his inspection and maintenance, he was polite and very personable. He made necessary chore quite pleasant and we’d be happy if you sent him to us the next time that we need service. For Albert and Helen as well as myself, their son, we thank you and thank Neil Junior. 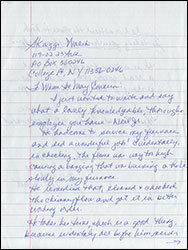 I just want to write and say what a lovely, knowledgeable, thorough employee you have – Neil Jr. He had come to service my furnace and did a wonderful job! Evidentally, in checking, the flame was way too high causing a banging that was burning a hole slowly in my furnace. He remedied that, cleaned and checked the chimney flow and got it in better working order. He takes his time, which is a good thing because evidently all before him never realized or noticed the flame too high. So taking your time with things helps. He is a very fine man who did a real good job. I will be asking for him in the future for maintenance on my boiler. You have a very good employee there and I would not hesitate to recommend him. Dan, your service tech who fixed the boiler, was professional, patient and made sure everything was working right. It’s hard to find “good people”, but you certainly have that with Dan. 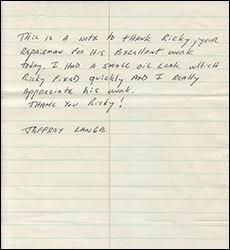 This is a note to thank Ricky, your repairman for his excellent work today. I had a small oil leak which Ricky fixed quickly and I really appreciate it his work. Thank you Ricky! On December 13, 2016 we had service done on our boiler. The gentleman from our church who met Chris, your mechanic at the site, gave a great review of the job done. Please thank Chris again. Sorry I don’t know your last name. Last Tuesday our furnace began acting up and then quit. 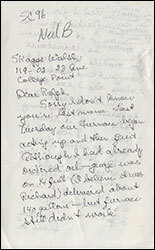 Although, I had already ordered oil – gauge was on ¼ full (I believe it was Richard) delivered about 140 gallons – but furnace still didn’t work. He called for more help and Neil came. He worked on it – I know for I was downstairs for a while. He added a new part and tightened valves also I was told. Suddenly heat. And surprise no bang, bang, boom while it runs. That’s why I waited so long to write this letter. It’s great to sleep through the night without that noise. I hope if I need a service man again I get him. 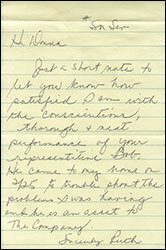 Donna, I had to have a service call at my Mom’s house on Thursday night for one of the tenants. I was shocked and pleased that a technician was able to get there so quickly and resolve the problem; he was courteous and did the job thoroughly, regardless of the evening hours. Ever since my Mom passed, I have had nothing but pleasant dealings with your company. I wish you serviced South Orange, NJ. When I had a problem with my heat a few weeks ago, I had to wait two days for someone to come. Since I couldn’t be there when the technician came, and since I highly doubt the tenant properly thanked the technician, I would appreciate your passing the enclosed to Gabe Sanchez. Please share my thanks to Gabe and to your company with your management. 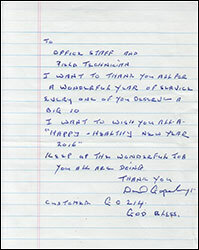 I want to thank you all for a wonderful year of service. Every one of you deserve a BIG 10. I want to wish you all a “Happy-Healthy New Year 2016”. Keep up the wonderful job you are all doing. Thank you for arranging a very timely oil delivery and start up service for us yesterday. The men were very helpful and professional. Best of all, they arrived early in the morning! Again, thank you for your prompt and courteous service. I would like to thank you for always replying quickly to my service calls. I wish you all a happy and healthy new year. Re: boiler service by Neil B. yesterday, we wanted to commend him to you for the superb job he did in correcting the boiler’s dislocation and recognize him for his attention to detail in servicing it. His thoroughness was appreciated, as were his suggestions on those few things I should do as the homeowner to keep it trouble-free. Your service man Neil Jr. was great! Helpful, courteous, professional. An asset to your company. My boiler wouldn’t ignite today – called and spoke to Maria – within 2 hours technician Ziggy arrived – he repaired the boiler and did the winterizing and yearly cleaning too. Your service was great and I am a very happy Skaggs-Walsh customer!! Thank you for the excellent service for oh-so many years! You guys are so great to deal with. THANK YOU! Just a short note to let you know how satisfied I am with the conscientious, thorough and neat performance of your representative Bob. He came to my home on 2/25 to trouble shoot the problems I was having and he is an asset to the company. God bless you and God bless the people at Skaggs for waiting on me as you all know I don’t work anymore and I don’t have help. I can’t tell how this meant to me. But God bless you all.